Seriously this is a lot of pink. And it is for a good cause. Pals Paper Arts is joining so many others in raising awareness of breast cancer. My all Stampin' Up! card uses only two stamps and three ink colors. I decided to get a jump on Valentine's Day designs with this challenge. Very cute! Love those hearts! Thanks for playing @ PPA! On behalf of the Pals Paper Arts design team, thank you for playing @ PPA. Join us Thursday, November 5 for our next challenge! I love this, Lisa! 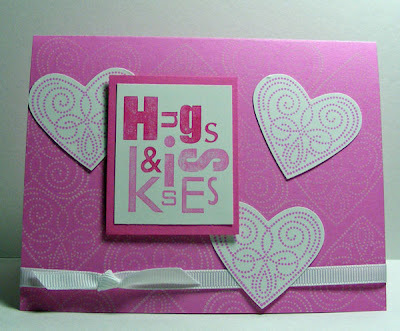 Love all the different shades of pink and the great sentiment stamp you used! Super job with the challenge!